I haven't attempted to ride my bike at all in the past few days. I have a hard enough time walking when I go outside. The district closed school both yesterday and today (which I think is a bit wimpy for a measly two feet of snow.) 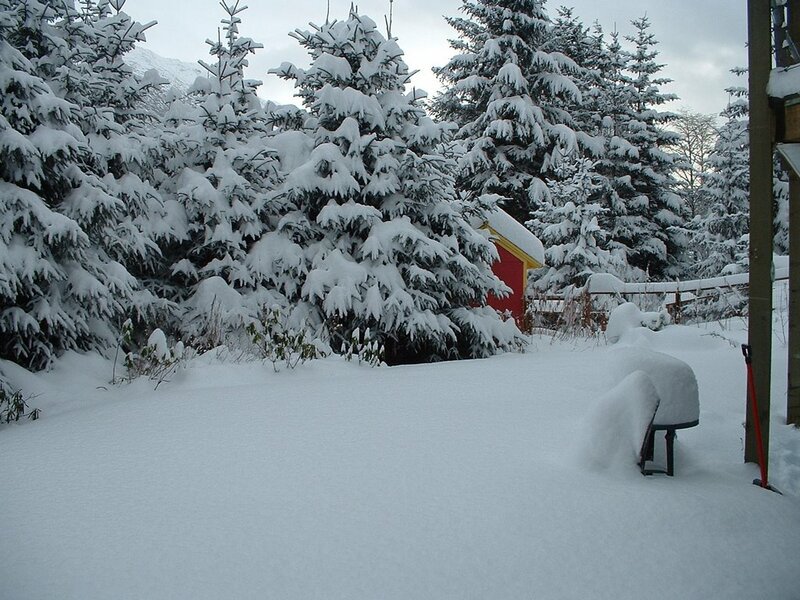 Still ... they told me it never snows in Juneau. They told me it would be ice and rain all winter long. I know I've only lived here three months, but, looking out my window over my whitewashed backyard, I think it does snow in Juneau. Maybe even often. So I have to wonder ... what does this winter hold in store for me? I finally took my car in to have the studded tires installed today. I always procrastinate things until they become not only an annoying but also inconvenient chore, so I was more than a little irked when a walk-in showed up five minutes before me and stole my 11 a.m. slot. But my conversation with her was an excellent example of how I think so much more like a cyclist these days. She told me that her studs were already on rims, and she changed them herself earlier this week, not realizing that they had all leaked out most of their air over the summer. "I drove around for two days on nearly flat tires," she said. "I didn't even realize it." I think she expected me to laugh. I just nodded and - without really thinking it through first - replied, "That's probably the best way to run them in this kind of weather." And I was about to launch into an explanation about the way low-pressure tires create a lot more rolling resistance, how the rubber grips better to slippery surfaces and the how the increased surface area floats more easily over deep snow, but her furrowed-brow look of confusion snapped me back to reality. So instead I just mustered a half-hearted laugh as though I had just made a bad joke. She ignore it entirely and said, "Yeah, I thought I'd be here all day, but it's just a quick fix so they got me right in." I went to the gym for an hour and then walked back to pick up my car. I drove away with four 14" studded tires running at a full 35 psi. I listened to the oh-so-familiar crackle of carbide on sheet ice and wondered what might happen if I ran them at 15. Hey Jill ,my dad works for a tire wholesaler and I used to put the studs in the snow tires with a stud gun back when I was a kid. If I remember correctly, you have a fairly small car? I'd run your tires at about 30 PSI instead of 35, you'll get better traction. Radial tires won't really deform that much (like bike tires) running 5 PSI less, but you'll get a better spring rate and better traction. They are tubeless, so pinch flats shouldn't be an issue. Two winters ago, I had good luck running 2" slicks (on my bike) at 30-40 psi.